Growing pains aren’t always a bad thing. Barely a year after opening a burger-and-craft-beer joint in an 1800s former railroad freight house in South Royalton, the partners behind the Worthy Burger plan to open a second spot in Woodstock this summer. The Worthy Kitchen will inhabit the old East Ender Restaurant at 442 Woodstock Road, says executive chef Jason Merrill. He describes the new restaurant as a “craft-beer diner” and a test kitchen for a constellation of spin-off businesses. 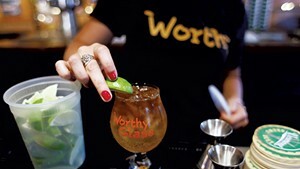 Merrill, who is again partnering with Dave Brodrick and Kurt Lessard, says that the Worthy Burger’s cozy kitchen couldn’t sate an increasing demand for their catering. “We needed a commissary to make this place stay alive,” says Merrill, who has scouted a spot for months. “We thought it would end up in the back of some warehouse somewhere, but we then found this space and thought it was perfect.” The airy East Ender, twice the size of the Worthy Burger, closed in 2011. Merrill thinks the Worthy Kitchen’s formula — casual, farm-to-table dishes and unique craft beers — will prove a good match for the town. “We know that Woodstock needs this kind of restaurant,” he says. The Worthy Kitchen will serve as a lab for various concepts the trio is working on. Like that of its sister restaurant, the menu will be limited to “five or six items,” mostly rotating specials. Among them might be the Worthy ’Wich — a sandwich of the day on house-baked bread; Worthy Noodles — creative variations on ramen; and fresh fish specials. (Merrill, who used to chef at Woodstock’s Jackson House Inn, works with Wood Mountain Fish.) Expect one or more of these new concepts to be spun off into more brick-and-mortar locations around Vermont, Merrill adds. Two things that oven won’t be used for are pizza — “There’s way too many pizza places around,” Merrill says — and burgers, which will remain a SoRo staple.